No one has answered correctly my challenge of a couple weeks ago to name the seven “squares” that are parks in the Minneapolis park system. The illion-dollar prize will, therefore, not be awarded, but perhaps will be rolled over into a new contest sometime in the future. The seven Minneapolis park “squares” are Murphy Square, Jackson Square, Bryant Square, Franklin Steele Square, Stevens Square, Lovell Square and Chute Square. Two squares were named only for the streets on which they are situated: Bryant Square in south Minneapolis and Jackson Square in northeast. Neither street name had anything to do with Minneapolis. William Cullen Bryant was a poet and Andrew Jackson was President of the US of A. Perhaps it is coincidence, but the only two squares not named for local heroes were also the only of the seven that were used as garbage dumps. In the case of Bryant Square it was with the blessing of the park board. The land for Bryant Square was well below street grade — 20 feet in some places — so before the park board agreed to buy the land for a park in 1904 it set the condition that no improvements would be made until the neighborhood filled the land. So the neighborhood dumped its garbage there. It wasn’t enough. Finally, after eight years, the park board spent $6,000 to purchase fill for the park. 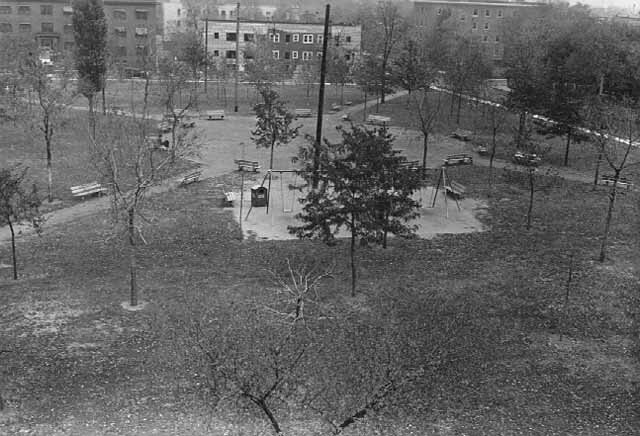 A few trees were planted and a bit of playground equipment was installed in 1913 and 1914. Drive past the park today and you will see that the playing fields are still below the grade of the streets around them. Bryant Square is the largest of the parks named squares at 3.66 acres. Jackson Square’s use as a garbage dump was not so well received by the park board. Only a year after it was acquired in 1906, park superintendent Theodore Wirth requested permission to erect a fence around the still-unimproved park to prevent neighbors from dumping garbage there. But that’s not as sad as the naming of the park. Before the park board acquired the land and chose such a bland name, the block was referred to as Long John Pond. Long John Square: doesn’t that sound more fun? Years later the city realized that the old Long John Pond had once served a useful purpose and recreated a drainage pond in the block south of the park, across from Edison High School. It’s not named for Long John either. Anyone in the neighborhood want to start a campaign? Can anyone tell us the story of Long John? Another square, Stevens, was also named for an adjacent street, but Col. John Stevens, for whom the street was named, was one of the pioneers of Minneapolis. His house, the first frame house on the Minneapolis side of St. Anthony Falls, now stands restored in Minnehaha Park. Stevens’ statue stands watch outside his old homestead. The statue was a gift to the city from his daughter Katharine Stevens Winston, whose husband, P. B. Winston, was once mayor of Minneapolis. The statue was placed in Stevens Circle, at Portland and Sixth Avenue South, in 1911. It lived there until that park was taken to widen streets in 1935. I think the statue should have been moved to Stevens Square, instead of Minnehaha. If you’re looking for some fun, place the statue of Stevens below into the park above and see where it looks good. You might also tinker with the hat. 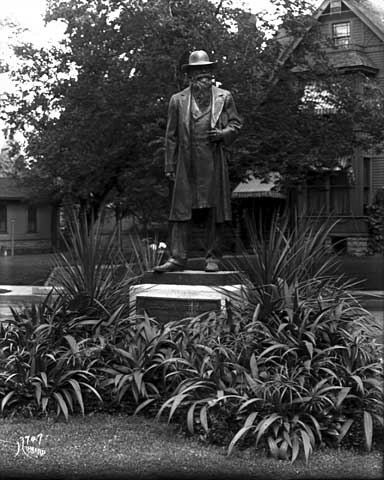 When the Municipal Art Commission gave its approval to place the statue on public land, it recommended that in keeping with the “natural dignity” of the character, the hat be removed from the sculpture. The commission also recommended that the statue be given some architectural backdrop instead of being a free standing sculpture, probably something more like the Thomas Lowry monument built a few years later. Obviously neither recommendation was followed. 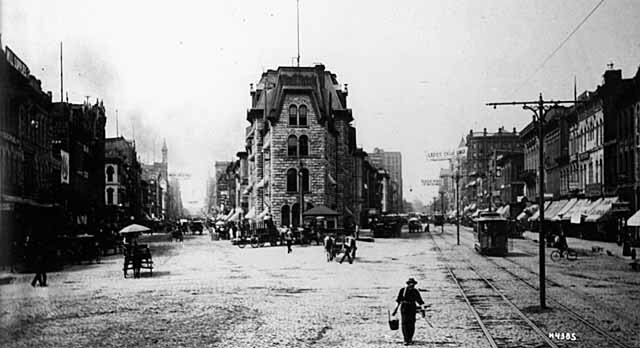 Murphy Square was the first park in Minneapolis, donated by Edward Murphy to the city in 1857. I’ve already written about Murphy Square here. Like Murphy Square, Franklin Steele Square and Lovell Square were donated by the people or families whose names they carry. Franklin Steele Square was donated by the three daughters of Franklin Steele in 1882, a year before the Minneapolis Board of Park Commissioners was created. They donated the land on the condition that Charles Loring take charge of improving the park, which he agreed to do. (Loring had just lost his bid to become mayor of Minneapolis and the park board, of which he became the first president, had not yet been created, so he had some time on his hands — and he was well-known around the city for his interest in landscaping and horticulture.) Franklin Steele built the first bridge across the Mississippi River, among other notable pioneering achievements. 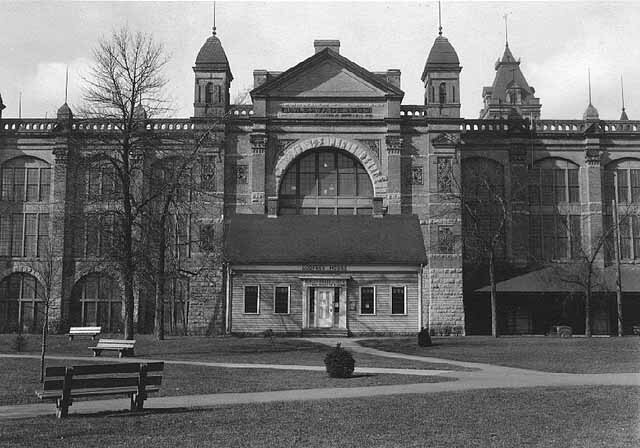 Seven years after Steele’s daughters donated land for the park, they were opponents of an effort to create another new park when the state of Minnesota purchased by condemnation the land for Minnehaha Park, which included the falls. Two of the daughters owned land taken at that time and appealed the case to the courts, where they lost. Franklin Steele Square, now hemmed in on two sides by freeways, is nothing like it once was. The freeways nipped 0.14 acres from the park in the 1960s. Lovell Square in north Minneapolis was a gift to the park board in 1887 from C. P. Lovell, Elwood Corser and William Barnes, influential real estate developers in the city. The three also deeded the land for nearby Barnes Place. Elwood Corser had also donated land for Lake of the Isles Parkways. Corser and Barnes were often appointed by the park board as appraisers in land condemnation proceedings for parks. Chute Square, the smallest of the squares at 1.1 acres, is the site of the Ard Godfrey House in old St. Anthony. It is named for Richard Chute an early landowner in St. Anthony. In an unusual twist, the square was named not for someone who donated land, but from whom some of the land was purchased. Richard and his brother Samuel, who served on the first park board, had owned some of the land that was converted into park in 1903. Surrounded now mostly by condos and townhouses, the square once had a more imposing neighbor, the Exposition Building. 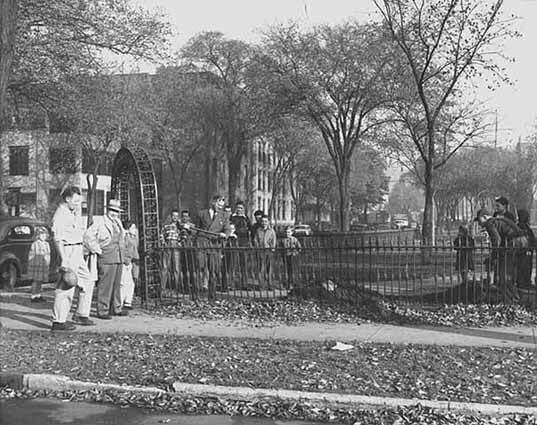 The Hennepin County Historical Society proposed in 1955 to build a history museum on Chute Square, but the park board rejected the idea because the square was too small. Over the years the Minneapolis park board has lost two squares, too. Market Square was given up to build the Exposition Center in 1886. Pioneer Square which occupied the land across from the downtown post office was taken over by the city in the 1960s as a part of urban renewal. Probably the most famous square in Minneapolis history, Bridge Square, at the intersection of Nicollet and Hennepin in front of the Hennepin Avenue Bridge — the hub of the city — was never a park, but the old Gateway park nosed up to it from the west on the City Hall site. The original Gateway was also demolished for urban renewal. The Gateway was a big triangle and a big failure as a park. And it remains a cautionary tale for those who wish to create downtown parks.